People who bring their kids to Vegas deserve to be dangled from the top of the fake Eiffel Tower until they see the error of their ways. That’s if having to stay at Circus Circus isn’t deterrent enough. But now there is a Las Vegas that it actually is OK to take your kids to. 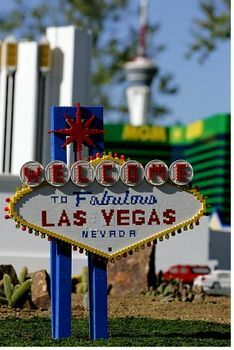 Legoland California last week opened its doors to Miniland Las Vegas. What model village on earth could be cooler than Las Vegas made out Lego, I ask you? I’m sure there must actually be a Lego Empire State Building or Sphinx, but now there’s also a whole miniature town of fake landmarks made out of tiny building blocks. Fantastic. I’m hoping we get chance to make the trip over there in the summer (it’s a four and a half hour drive to Carlsbad CA, about 30 miles north of San Diego). But until I can take my own photos, I’ll link to other people’s. The press release puts the brick count for the ten replica hotels at 2 million and time to build at 16,000 man hours, over three years. Three years is a long time in Las Vegas, and so not surprisingly it’s already a litle bit out of date. The rides at the top of the Stratosphere date it as circa 2004. X-Scream (opened October 2003) is there but Insanity (opened March 2005) is not. The High Roller coaster, which was dismantled and removed in December 2005 - possibly using a big parachute, although really that’s just wishful thinking - is still there in Lego form. The Treasure Island replica still features that cumbersome name in full, although it is built from bricks that resemble its new colour. Perhaps a post-production paint job? The new "TI" sign has been around since late 2003 but is missing in Legoland, although the Disney-esque skull and crossbones has been removed from the marquee. A few feet over at Excalibur, the Merlin figure is missing from his window in the castle - he was pulled out in real life only last month – but I expect that yoinking a wizard is a fairly easy modification to make. I know it’s no longer cool to be a themed resort (as shown by the rumours about Luxor’s new name, which might not actually be nonsense) but just how are Excalibur going to get away from the fact that their pretty big hotel – the largest in the world when it opened – is shaped like a giant castle? The sign at Paris appears to say "Paris Rock". Presumaly this is a reference to the Queen show "We Will Rock You" which used to play there. It closed in November 2005. If you look closely, you can also see a Blue Man Group advert on the Luxor marquee. They moved to the Venetian in October 2005. I’m sure there’s more, but I’m working from only a few photos that have been put online since it opened a couple of days ago. Not bad pedantry at all, I don’t think. There’s a video here if you want to see more, including a working model of the Monorail. So far that one is still just about accurate.